Cowra Paint Plus Phill’s Blinds and Awnings has been measuring and fitting blinds and awnings for more than a decade and have a wealth of knowledge in this industry. In their showroom, they have a vast product range on display which includes blinds, curtains, awnings, plantation shutters and security shutters. They also specialise in all things paint. 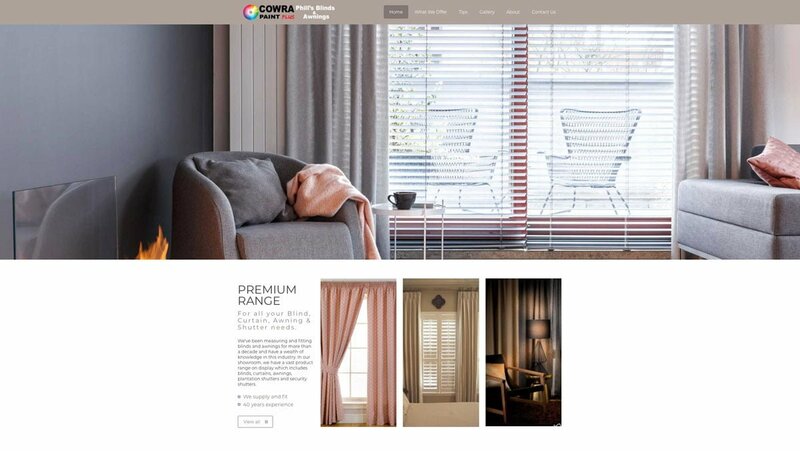 Cowra Paint Plus Phill’s Blinds and Awnings approached us to create a professional website for them and asked us to do a full SEO review to rewrite all the copy for the new website taking into account SEO best practices and identified keywords. Cowra Paint Plus Phill’s Blinds and Awnings is based in Cowra, NSW, so no matter where you’re situated, get in touch with Social Web Works today and find out what a huge difference we can make to your online and marketing success.